I’ve had the opportunity to present stories from the project at a number of conferences, and community events. Each opportunity has drawn out memories and flat stories which continues to enrich the project. Below are links to the presentations or publications where they are available online. Scarfie Flats of Dunedin published. 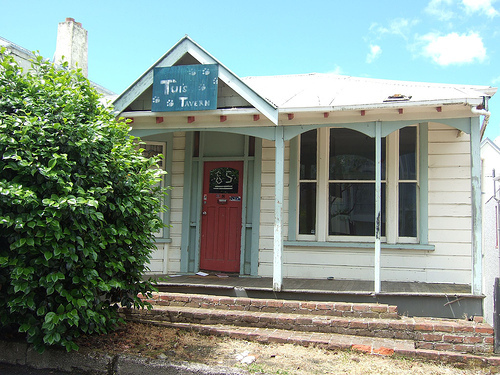 Dunedin #Flatnames Project . National Digital Forum, Te Papa, Wellington, November 2013. Community Voice: Society through the ages. Dunedin Public Library, Dunedin, October 2010. Hanging out: preserving an ephemeral print culture in Dunedin. LIANZA Conference, University of Otago, Dunedin, December 2010. The inaugural NZ Twitter Conference [#TweCon], December 2010. Pecha Kucha #5, Dunedin Public Art Gallery, Dunedin, March 2010. My Flat Your Flat Our Place – an exhibition at OUSA Art Week, University of Otago, Dunedin, August 2009. View the online version.